A dental implant is a small titanium screw that serves as the replacement for the root portion of a missing natural tooth. Dental implants can be placed in either the upper or lower jaws. Due to the biocompatible properties of titanium, a dental implant fuses with the bone and becomes a good anchor for the replacement tooth. Dental implants are the best options for replacing single or multiple missing teeth. There are a number of reasons why you should consider a dental implant: * Without the root of a natural tooth present, the jawbone 'melts away' or shrinks, causing one to appear older than they are. Dental implants help individuals keep a more aesthetic facial profile and appearance by preserving bone. 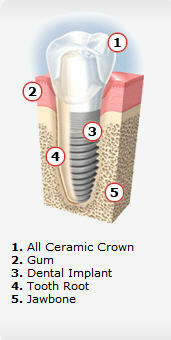 * Dental implants restore function closest to that of a natural tooth. They feel natural and look natural; they are not prone to cavities nor root canal issues. Dental implants are stable and comfortable and adjustments are rarely needed after placement. Speech is as close to having your natural dentition and chewing and eating is more enjoyable when not dealing with sore spots, food getting caught underneath dentures and dentures moving around. Typically, dental implants will serve its purpose for life. Dental implant placement is an intricate, well thought-out and accurately planned procedure. It is most ideal to choose a surgeon who has had extensive training and experience in this area. Dr. Minutello has been placing dental implant fixtures since 1986 and has successfully completed over 15,000 dental implants. The fee for tooth replacement with dental implants depends on several factors, including the number of teeth being replaced and the number of dental implants required to support your missing teeth. Some additional procedures may be required prior to the placement of dental implants to ensure its long-term health and stability. To obtain a specific fee estimate, it is necessary to have us examine your mouth. After a thorough diagnostic examination, we will recommend the treatment that is best suited for you. Anyone who is missing one or more teeth due to injury, disease, infection, or tooth decay may be a candidate for dental implants. The determining factor is the amount of available bone. Dr. Minutello is the best person to evaluate whether dental implants are a viable solution for you. Our Practice utilizes the latest technology in Cone-Beam CT to determine the quality and quantity of bone that you have. We work closely with your restorative dentist to determine the best and most reasonable treatment for you! Occasionally, older patients express concern that their age may prevent them from enjoying the benefits of dental implants. However, health is more of a determining factor than age. If you’re healthy enough to have a tooth extracted, you’re probably healthy enough to receive dental implants. Certain chronic diseases may contraindicate dental implant treatment. Dr, Minutello can determine if you are a candidate for dental implants after a thorough dental and medical evaluation on you. Preserve natural teeth: With traditional dental bridges, teeth adjacent to missing teeth are normally ground down to be used as anchors for a dental bridge. Dental implants, a more conservative choice, eliminates the need to modify healthy teeth. Besides surgical advancements, improvements in dental implant products allow Dr. Minutello to deliver dental implant placement the same day as tooth removal. This means that the immediate placement of dental implants shortens the amount of time from the day the tooth is removed to the day the implant is restored by six to twelve weeks! The conventional process can take from over three months to a year for the completion of the process. First, the dental implants are surgically placed and left for three, six, or nine months to heal and integrate with the jawbone. During this healing period, a temporary prosthesis is fabricated for your use until the permanent crown is put in place. The procedure chosen depends on several factors, such as your dental health, the necessity for bone augmentation or not, the number of teeth involved and which teeth are replaced. These factors will also determine the total number of visits to our office throughout the treatment period. Every person has a different tolerance to discomfort. We assure our patients that should they experience any discomfort, it is kept to a minimum by the following the post treatment instructions given after the procedure. Anesthesia and sedation are commonly advised to help reduce any discomfort during the dental implant process. Most patients report that they were much more comfortable following the procedure than they had anticipated. Dr. Minutello will prescribe medications to ease any discomfort that may occur. If you are one that bruises easily, you may have some bruising and swelling in the gums and soft tissues. As mentioned earlier, any possible discomfort, if any, is treated with medications and cold/ hot compresses. Dental implant patients have typically returned to work the next day. Your new implant supported teeth must be cared for and checked regularly, just like your natural teeth. Brush and floss daily and follow the recommended schedule given by Dr. Minutello, which includes seeing your restorative dentist.